"Mom? What if I fell asleep and fell into my dreams and then I couldn't get back out? Like I fell so far that I couldn't climb back out of there and just stayed in the dreaming part?" "I'd have to climb down in there and get you out and bring you home." And isn't that what we all want? Lucky Bob Rosenberg. Didn't they make a movie about that? Perhaps Bob is following in your writing shoes. He's already writing blockbusters. Hasn't he read The Runaway Bunny? Moms can go anywhere and do anything. Of course you would and could. 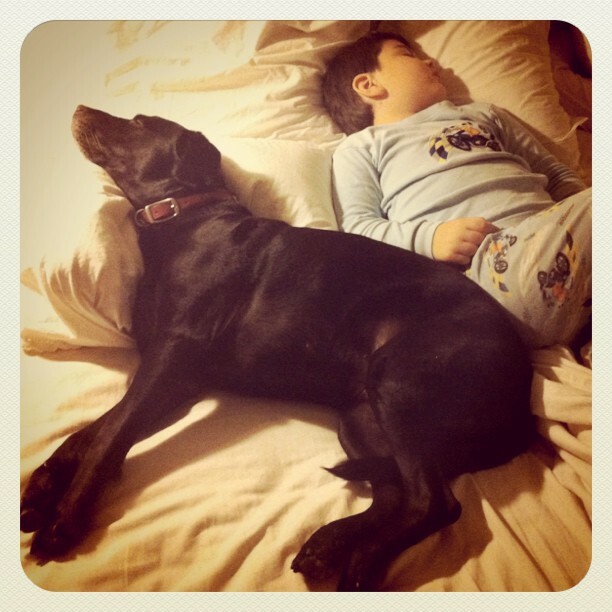 I love the picture of Bob in his jammies with his guardian angeldog. I sleep so deeply that I awake most mornings wondering where the hell I went. I was a afraid to go to sleep as a kid. Maybe because of that. Bob is asking a big question. You gave the best of all possible answers.